The mucosa, composed of simple epithelium cells, is the innermost layer of the gastrointestinal (GI) tract. It is the absorptive and secretory layer of the GI tract. 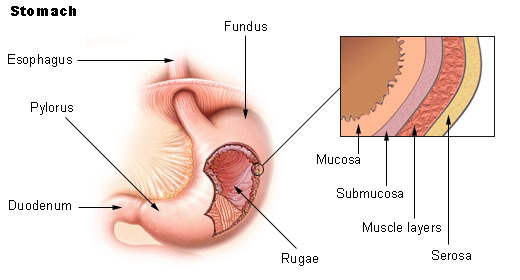 The mucosa is the innermost layer of the GI tract. It is made up of three layers: the epithelium, lamina propria, and muscularis mucosae. The mucosa surrounds the lumen, or open space within the digestive tube. This layer comes in direct contact with digested food (chyme). The epithelium of the mucosa is particularly specialized, depending on the portion of the digestive system. lumen: The inside space of a tubular structure, such as an artery or intestine. The GI tract is composed of four layers. Each layer has different tissues and functions. From the inside out they are called: mucosa, submucosa, muscularis, and serosa. The mucosa is the innermost layer, and functions in absorption and secretion. It is composed of epithelium cells and a thin connective tissue. The mucosa contains specialized goblet cells that secrete sticky mucus throughout the GI tract. On the mucosa layer, small finger-like projections called villi and microvilli help to increase surface area for nutrient absorption. Layers of GI tissue: Note the mucosa, located at the innermost layer. Since the mucosa is the innermost layer within the GI tract, it surrounds an open space known as the lumen. Food, mucus, and digestive juices pass through the lumen, and the mucosa comes in direct contact with digested food (chyme). General structure of the gut wall: This cross section shows the mucosa in relation to the interior space, or lumen. The epithelium is the innermost layer and it is responsible for most digestive, absorptive, and secretory processes. The lamina propria is a layer of connective tissue that is unusually cellular compared to most connective tissue. The muscularis mucosae is a thin layer of smooth muscle and its function is still under debate. The mucosae (singular: mucosa) are highly specialized in each organ of the gastrointestinal tract in order to deal with different digestive tract conditions. The most variation is seen in the epithelium tissue layer of the mucosa. In the esophagus, the epithelium is stratified, squamous, and non-keratinizing, for protective purposes. In the stomach. the epithelium is simple columnar, and is organized into gastric pits and glands to deal with secretion. In the small intestine, the epithelium (particularly the ileum) is specialized for absorption, with villi and microvilli increasing surface area.